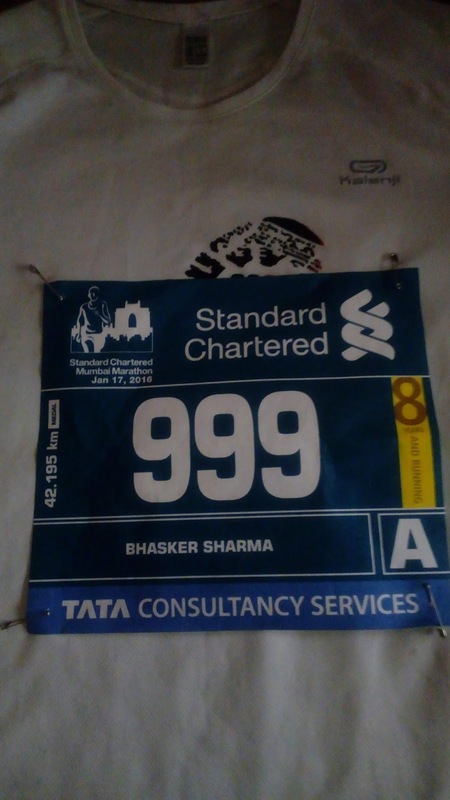 Musings of a maverick Bangalore runner: Turn around at SCMM 2016 ?? Turn around at SCMM 2016 ?? With just about 12 hours to go for my 11th FM at Mumbai , as usual, the anxiety level is going up. As per my family members I was extremely tense all day before taking the flight to Mumbai on Friday evening. This is an event that I have always aspired to do well. And have been fortunate enough to have my timing improve Y-O-Y from 4:42:38 in my first FM at Mumbai in 2006 to my PB of 3:37:20 in the 2013 edition. After that race I have run 4 FMs and all of them have been slower than 3:45 with the last two being slower than 3:50. The anxiety is compounded by the fact that for the first time in 10 years I have not run a FM for 12 months , that is, SCMM 2016 will be my first FM since SCMM 2015. Nevertheless, I feel fitter and more confident compared to last year. With a couple of decent 35KM+ runs and a fastish HM(sub 1:51) in a hilly terrain 2 weeks ago I feel that a sub 3:50 should definitely be possible unless something goes terribly wrong tomorrow. And if everything goes 'perfectly' well then even a sub 3:45 may be possible. Anything slower than 3:52 would be very disappointing. To have a high chance of achieving 3:50 I am going to try an keep an average pace of between 5:22/Km and 5:25/Km to get to 21.1Km mark between 1:53 and 1:54. And the 35Km mark in about 3:08 and then push as hard as the body and mind will allow for the last 7Km!! The Bib collection process today was a bit of a bummer. After standing in a Q for over 15 minutes my bib could not be found and I was directed to a back office guy who in turn directed me to the separate Q for 'enduranz club' members. My bib states 8Y and running for having done at least 8 FMs in a row. I was quite unhappy as it should have said 10Y instead of 8- apparently Procam does not have data going that far back which is a pathetic excuse. Here's wishing favourable conditions for all running friends to have a fantastic run tomorrow.